My favorite jeans took a beating; and after discovering that it takes more than 2,800 gallons of water to make a single pair, I decided to keep them. The fact is, I really did buy a new pair of jeans. Picked them out, stepped out of the dressing room, handed the pair to the clerk for hemming, only to find out a week later that the clerk marked the wrong pair of jeans. The altered pair, ready for pick-up, didn’t fit. In the meantime, temperatures kept dropping, my knees kept freezing, and the holes kept spreading. I know holes in jeans look great — but, like I said, the holes were growing, and I was down to my last pair, and I was cold. 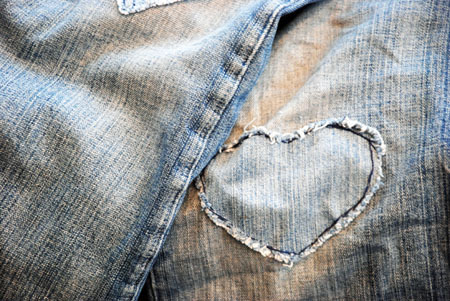 I grabbed needle and thread, and began to cut a patch, heart shaped, from another pair of equally-worn out jeans, and sewed the patch over the holes in the knees. This took longer than I thought it would. I could have used my Mom’s sewing machine, but I’m really not sure how to thread the bobbin, and anyway, how in the world would you keep the other side of the jeans from going through the machine? I was sure I’d sew the leg shut. So, I took my time, and did it the way Laura Ingalls Wilder’s Mom would have done it. I’m sure Mother Earth would approve. Although, I’m not too sure about my Mom. I love those; they look so comfy. I was so sad when my favorite pair of jeans (that I wore in college) broke the zipper out. I haven’t had a favorite pair in a loooooong time. Cute idea! Not entirely sure I could get away with a heart patch on my “work” jeans, mind.